Finished up the sanding and hand waxing on these scales this morning. Brass pins and lanyard tube. LOVE IT!! Great job on the fit and finish and design. 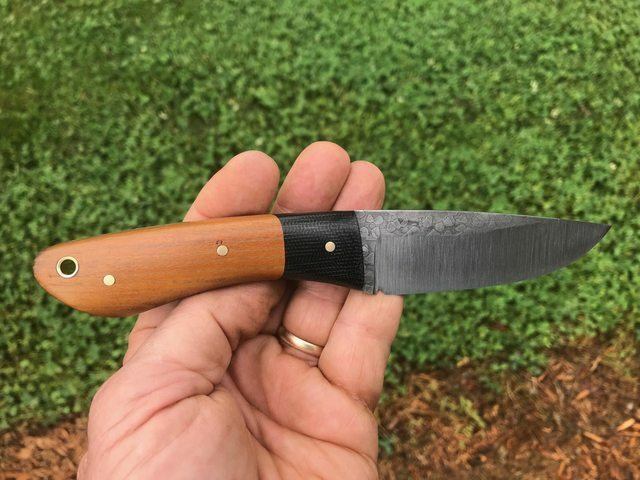 Can you walk us through how you joined the micarta and Osage? Really really nice job OP. Thanks Kevin! This is how I go about it. I angle my grinder to about 23 degrees and I square my tool rest to the belt. Then I use a square to clamp a guide board to the tool test (giving me a 90 degree angle guide to the belt). I slide the micarta and wood pieces along this guide board to the belt. Theoretically each piece should have the same exact angle. Flip the micarta over (or visa versa) and match it up with the other material. It should match up perfectly. At that point you can clamp and glue the pieces together. That's one of my favorites so far, OP. Nice work! Thank you! I really like working with the Osage. Thanks! I do the same. I’ve been wanting to play around with hidden pins. I’ve never had a two or three piece handle handle fail, but I know that a hidden pin would be even stronger.... I’d think at least. Are you talking about in the angled joint itself; kind of like the biscuit concept? It wouldn’t hurt for sure. As it is I can’t see how the joint would fail unless the epoxy and through pins failed. I guess that could happen with a one piece or two piece lay up. Real nice!! Love the colors...and I like that the pins follow the "flow" of the knife...good eye! That knife is AWESOME it looks Rugged yet classy! Wonderfully done sir! A good using knife design stands for itself but when it has classy funriture there is a step up in the vusual. I like the colour combinaton and do it with blackwood and buffalo horn for a similar contrast that seems to be a natural for knife handles. Great job. I too like the contrasting colors. Nice blade shape as well. Splitting the materials/colors of a handle works best when the two materials/color contrast to each other! You done well on this one OP! I have never used any Osage, but I understand that will go to a golden brown when exposed to the UV of sunlight, pretty much no matter what kind of sealer is used. Thank you. Osage takes on a character of its own as it ages. It is one of my favorite woods to work with. It sands well and takes a nice hand polish. Looks good! I like the looks of Osage orange. We call it hedge around here and it grows everywhere.